The balance mod really changes that matchup. The Arilou have an easier time getting in with their offensive teleport, and the Chenjesu have a much better flak screen. I think the changes favor the Chenjesu a lot. Arilou wins with 1 remaining Skiff! ANALYSIS:The ZFP’s AI found itself in a similar predicament as the Syreen, and it gave the appearance of programming mechanics glitch in the same fashion, although it was to a much lesser degree. Once again, as with the Penetrator, conventional wisdom would dictate it would be a better strategy to move away from the Skiff, and then aim in the opposite direction whilst allowing the directional inertia to keep the ship travelling away from the pursuer. The wide-spread Antimatter Spray was really the only saving grace for the ZFP, since the minimal damage and sporadic nature of each pellet causes the Skiff to be reluctant to teleport away, allowing some of the shots to occasionally hit, but once the Skiff got behind the Stinger, it could park itself in between their 3 engines and unleash until the Stinger was obliterated. There was one interesting development, where they ran out of battery juice and got too close to the Stinger’s front side and got themselves pulverized by a vicious tongue attack! Last edited by The Troglodyte on Fri Sep 29, 2017 5:36 pm, edited 1 time in total. Imteresting, but expected. I find the antimatte spray far too ineffective, and thus the Stinger grossly underpowered.. .
Ooops! Obviosuly supposed to be behind the Stinger, not itself! Eh, who knows? The Arilou do inhabit a different *time* after all... maybe they could actually accomplish that seemingly absurd scenario. I'm sure we would understand as well, were our context to be broader. If our context was broader, we would actually see the two skiffs at the same time, and howm hey both hit the Stinger, thus ensuring victory. krulle wrote: If our context was broader, we would actually see the two skiffs at the same time, and howm hey both hit the Stinger, thus ensuring victory. Note to self: Triple check content before posting. Arilou wins with 2 remaining Skiffs! ANALYSIS: Not bad, if I do say so myself. I should’ve won with zero casualties, but I accidentally ran into the planet and kept banging into it several times before realizing what was going on, since it occurred with the planet being slightly off-screen as my flying saucer attempted to punch holes in its atmosphere. The action was so fast-paced that I neglected to ever press the pause button (or take screenshots) like I usually do to quickly jot down some battle notes, so instead I got ahead of myself and was already preparing to mention my close encounter with planetary death that I failed to teleport out of the way of a plasmoid that hit my Skiff at close range. I can’t even remember how many ships in I was at the time, maybe the 8th or 9th. Not sure. Other than the one moment of my attention wandering, pitching a shutout against the Podships wasn’t really too difficult, but it could get tedious at times to teleport when you feel that dodging and pulling the projectile into its maker is so rewarding, that corner cutting for this match-up can become very tempting, since the desire to quickly relinquish their ships can sometime supplant patience, especially when there’s so much to quickly process and micromanage when using a Skiff in battle. I’ll reiterate for emphasis… Patience is the key. One other interesting tactic I managed to deploy was something I’d like to call the “bump and blast” maneuver: First, you move towards the Mycon until they fire their weapon (and if they happen to be too stupid and choose not to fire, opting instead for crew regeneration, then feed them lasers for their foolishness!) Next, activate the teleporter to avoid destruction and see where you reappear. If you happen to appear in the incoming path of the Mycon vessel, try to intercept the ship and, if possible, attempt to collide with Mycon (while watching out for plasmoids, of course). 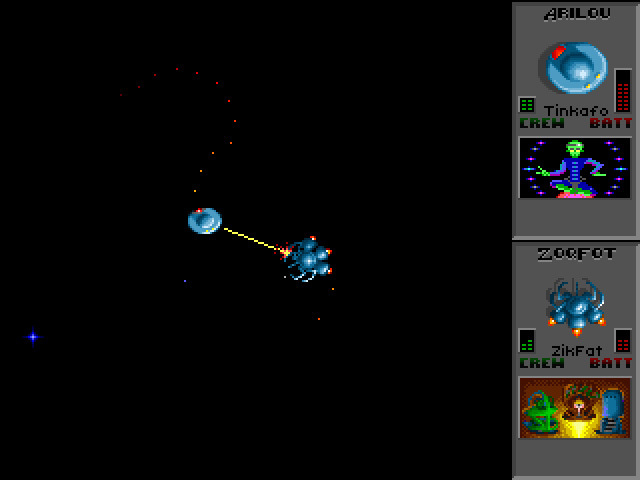 There’s no need to worry about the collision though, because Star Control game mechanics has a built-in “bumper car”-like effect, so you don’t have to be concerned with incurring any damage while running into other moving ships (with one notable exception); the Mycon will harmlessly bounce off the Skiff, usually nudging it a little in the process, but its momentum will be effectively lost and its lack of good acceleration will give you ample time to circle around it and blast them to smithereens while also maintaining a perfect position for bringing their own homing projectiles back to it in order to finish them off with some added flair!